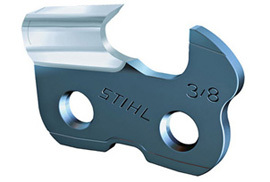 Special Rapid-Micro horizontal saw chain, primarily for use in conjunction with horizontal cutting devices as well as mobile small sawmills such as Logosol. This semi circular toothed chain is characterized by a low vibration level and soft cutting behaviour. Required File size 5.2mm / 13/64"